You are here: Home / trends / How is the economy affecting your art? How is the economy affecting your art? We want the hole, um, I mean whole, story. We recently had a chat with Andrea Shea, the arts reporter from WBUR radio. She’s trying to get a handle on the economic downturn, particularly as it relates to artists here in Massachusetts. So pony up to the ArtSake blog and let us know what you see happening. Are there any trends you’ve noticed? Are you experiencing any dramatic decreases in sales, performance opportunities, publishing? Any increases? Are you worried about your teaching jobs? Is your day/night job(s) threatened? Perhaps most importantly: how are you responding? Don’t be shy, let it fly – just leave a comment and join the conversation. 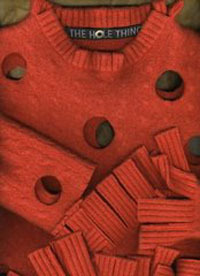 Image: Recycled sweater from Louise Cady-Fernandes’ THE HOLE THING series. Louise is a member of Boston Handmade, a collection of Boston-area artists, artisans, and craftspeople. I like your question! I am a member of the Lexington Council for the Arts and am happy to see MCC expanding your online presence like you have. I am also an artisan that creates a line of sweaters, housewares and accessories from recycled sweaters. What I have found is that I am selling more smaller, less expensive items but also that I am experiencing the public’s growing interest in buying handmade, locally produced products, that are frequently green. So this is good news. I am also a member of Boston Handmade, a local group of artists and artisans. We are all optimistic in many ways about this new trend. Although the downturn in the economy has been very hard for so many people, and I too am very worried, I also am seeing a bit of a silver lining to what is happening. People are spending more time together and doing things that don’t cost a lot of money. They are gathering more at home to eat, going for walks, checking more books and videos out the library and generally getting less caught up in the mass consumerism of our society and keeping up with the Jones. Perhaps this downturn in the economy is going to be a great community builder. It is certainly better for the environment. Louise – great to get your insight. Interesting that there may be some upsides for artists and artisans amidst all this economic turmoil. Thank you for this opportunity! I am a mixed media painter and teach classes and workshops. My classes are holding steady this past year–not a lot of new students, but steady with on-going ones. My art sales, however, have really declined over the past 8 months–no matter how small or inexpensive I am selling. My workshops are doing ok, but I am charging half of my usual fee. What is expanding is my own passion for creating! I have recommitted to making art, no matter what–and that feels GOOD! Times are tough and sales slow to non-existent. Art is and remains a luxury purchase and when folks are worried about their portfolios and kids college tuition, acquiring big colorful paintings and sculptures take a back seat. There are always exceptions of course but people are watching their wallets! I do see this time as artistically stimulating where artists really get to prove their “love” of creativity and the process, specially since a sale at the end of the tunnel is tougher. It is important for me to sell work but more important to produce work! I believe people will start purchasing work again in the future when the recession lifts!! I’m a night writer whose productivity diminishes when I haven’t a dayjob. Sitting around the house during the day makes me doubley useless because I am neither earning a paycheck nor writing. The formula of working 9 to 5 then flicking a switch and going artsy somehow makes me write more…and more intensely. There is also less to write about since transportation costs keep me limited to a small area of the city. The upside is that I am in fantastic physical shape from walking an extra half hour per day to save money; plus, I get to stroll along listening to birds, gazing at the sky, and smelling the cold air. Despite the ongoing drumbeat of bad economic times and constant stories in the media about layoffs and downturns , I’ve been surprised to find new commissions coming in . I build & repair ship models and 2009 is my 30th year doing this as a full time professional . I had expected to coast through the winter on the backlog of work in my closet – repairs & new pieces , and had been worrying about the future thinking that it was going to all dry up . Ii had anticipated a slowdown as an opportunity to execute some original projects that had been in mind for a long time , but had been too busy to get into . Since New Years several major commissions have come in and my back orders haven’t been reduced that much , and there have been a number of inquiries , so for the moment , things are OK . What a surprise ! I do high end pet portraits and rely on word of mouth. Editorial advertising is too costly. I had a good run in the fall of ’08. A few new commissions were also on the burner but seem to have faded away. I also do large scale skyscapes and will be participating in a group show at the Yarmouth Cultural Council in April and have decided to scale down with smaller paintings and collages. I must for now, put my next skyscape on the back burner. I look at it as an opportunity to explore new creative streams within me and I’m grateful for the ability of being flexible! Best of luck, fellow artists ! I am a practicing artist and teach art/fashion at the college level. This semester I’ve decided to forego all the old rules and have explained to my students that everything has changed and that the only thing we can count on is that nothing will ever be the same. I prefer to view that as a good thing, a stimulating perspective that will power up this country’s strengths. It is a wonderful time to invent, to experiment, to follow old passions and to cater to the creative impulse. My own work has become much more fun to produce because it feels free of commercialism and pops out unencumbered by agendas. My faith in this country remains unwavering and frankly, I am thrilled to have all the status symbols, the shallow decorations and wastefulness move off the stage. Show us what you’ve got artists. I am a jewelry designer and teacher. I own a beading supply shop. People are definitely still interested in classes. What is nice about beading is that is can be as expensive or as inexpensive as you want it to be, so even in an economic downturn people will still pursue the hobby. Plus, it makes for a fun social gathering! I am still selling jewelry pieces as well, and people seem to have a deeper appreciation for the quality of handmade goods. People may not be buying as much, but they are still buying. So far, so good. Keeping my fingers crossed! With more and more people accessing services during times of need (i.e. homeless shelters, mental health services, local health clinics, etc) the need for art is only growing. Experiencing original art can stimulate dialogue, creativity, learning and healing, and – as all artists know – art can feed the soul. The Art Connection is a nonprofit in Boston that works to increase the access of art by facilitating the donation of artists’ work to community nonprofits that could otherwise not afford to have art in their space. Recently, more artists seem to have been generous in making their art available to benefit the community – many thanks to them! If anyone knows an artist interested in donating artwork or a nonprofit interested in receiving artwork – please refer to our website at http://www.theartconnection.org.